In the Veneto, the little known Durello (also known as Durella) grape is used to make sparkling wines. I have tasted one or two before and liked them so on a visit to the region last December, I was hoping to taste some others. But as luck would have it, none of the producers we visited made one. In May, I found myself in the Veneto once again. To my surprise, Azienda Marcato one of the producers we were scheduled to visit, specialized in sparkling wines from this grape. They also made a Passito which I had never tasted. 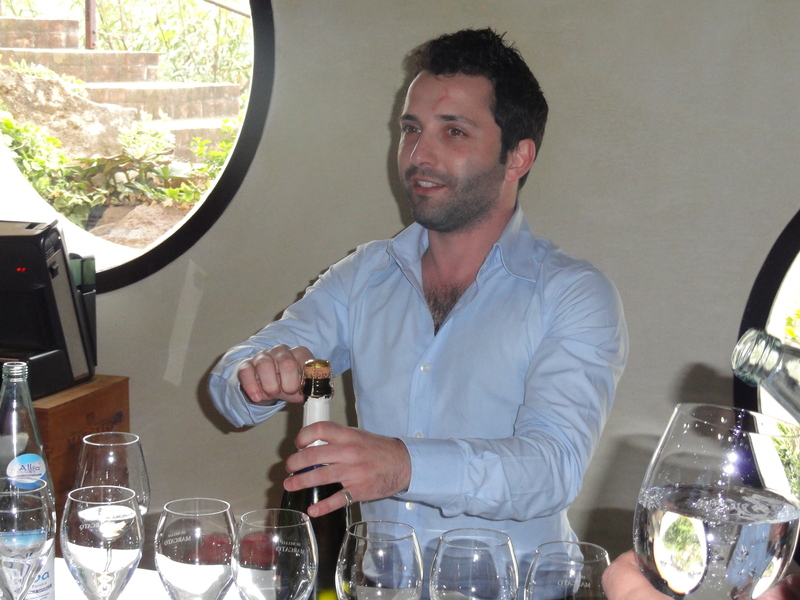 The tasting and tour of the Marcato winery was led by Enrico, the son of the owner, who proved to be very enthusiastic and informative. 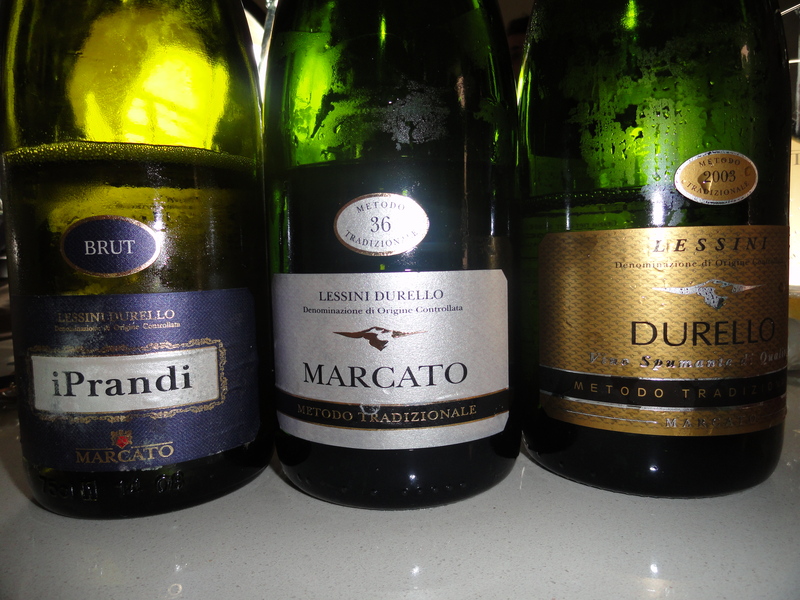 When I told him I was interested in the sparkling Durello, he said he would let me taste all of their production. He told us that the most popular style is the Spumante and many feel it is the best expression of the DOC. The DOC for Durello was established in 1987 and covers an area high up in the hills on the border between the provinces of Verona and Vicenza, in the area known as the Monti Lessini. The production zone for Lessini Durello is of volcanic origin. The hills on which the vines grow are layers of rocks formed by lava flows. The soil is dark, stony and rich in minerals and fossil deposits. Geologically, the soil is of volcanic tuff basalt. There are 500 growers but only I0 of them actually bottle the wine. 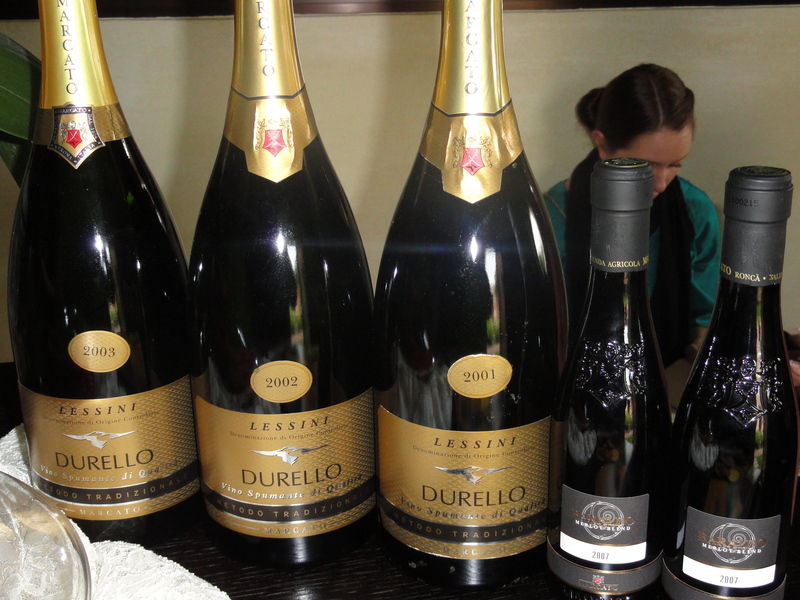 About 600.000 bottles of Lessini Durello are produced a year, mostly as sparkling wine made by the Charmat Method. The grape is of ancient autochthonic origin and fossils found in the area are said to be the direct ancestors of Vitis Vinifera. Its vines are vigorous, disease resistant, and grow best in a soil composed of lime and clay of volcanic origin. The clusters are medium sized, pyramid shaped (sometimes with wings) and compact. The grapes have a thick and leathery skin (may be the reason for it name) and good acidity. Lessini Durello — The Spumante and the Passito must be 85% Durello and a maximum of 15% of Garganega, Trebbiano di Soave, Pinot Bianco, Pinot Noir and Chardonnay. At the Marcato winery I tasted a number of sparkling wines made by the Charmat Method (tank) and the Traditional Method (Champagne Method). I Prandi Estate — is on the site of the Marcato winery located on the Il Duello Hill between the two small villages of Ronca and Montecchia di Corsara in the heart of the Soave Colli Scaligeri area and Lessini area. It is 30km from west of Vincenza and 30km east of Verona. I Prandi-Lessani Durello Brut – Charmat Method – Pergola Veronese method of training the vines, all the grapes are from the Veneto region, Verona and the Alpone Valley. The wine is 85% Durello, 10% Chardonnay and 5% Pinot Nero. It is soft pressed, temperature controlled fermentation at 14-16 C, malolatic fermentation is complete and then there is a secondary fermentation and the wine is on the lees for eight months. It has a straw yellow color with greenish tints, tiny bubbles and good acidity like all wines made from this grape. I Prandi – Lessani Durello Extra Dry Charmat Method – 85% Durello and 15% Chardonnay. It is on the lees for four months and the residual sugar is 18g/Lt The wine is straw colored, fruity and floral, yeasty and mineral. 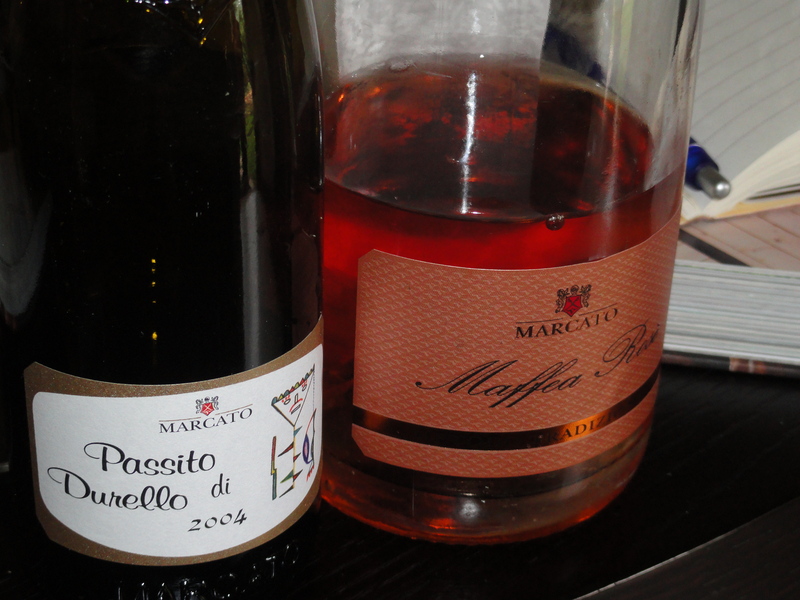 These were two of the best sparkling wines I have tasted that use the Charmat Method. The Barattaro Estate is situated at the foot of the Lessini hills in the village of Montecchia di Corsara in the heart of the Alpone Valley area. It is 32 km east of Verona and 27 km west of Vicenza. Lessini Durello “36 months” Traditional Brut Method – Made from 85% Durello and 10% Pinot Noir and 5% Chardonnay. It is on the lees in the bottle for 36 months. It is yeasty with citrus fruit aromas and flavors. Lessini Durello 60 Mesi Traditional Method Brut 2003 – Made from 85% Durello and 15% Pinot Noir. It is on the lees for 60 months. It has aromas of bread and yeast and a hint of almonds. Lessini Durello AR 2002 Traditional Method Brut. – Made from 85% Durello and 15% Pinot Noir. At least 10 years on the lees. This is a very complex wine with aromas of fruit, acacia, yeast and honey. Enrico let us taste this wine and told us that it had not been released yet. I liked all three of these wines but was so impressed by the 2002 that Enrico gave me a bottle of the current release the AR 2000. I drank it with friends recently and everyone was surprised that this grape could make such a great sparkling wine. Lessini Passito The Durello grapes are dried for four months. There is 24 to 36 hours of maceration and then a complete fermentation. It is aged in large oak barrels for two years and has a minimum alcohol of 14%.Enrico said that it is vinified in the same manner as Recioto di Soave. It had flavors and aromas of apricot, orange peel, hints of almonds and acacia with a nice finish and aftertaste.